NATURAL HABITAT AND PREFERRED SITE: Eastern 2/3 of Texas, primarily in river bottoms and deep, rich soils. Fruiting mulberries can adapt to a wide range of soils from sand to clays as long as there is ample moisture and drainage. IDENTIFICATION INFORMATION: Large spreading tree with big leaves, edible fruit and yellow fall color. FLOWERS AND FRUIT: Flowers are inconspicuous droops in the early spring followed by blackberry-like fruit which ripen and drop from the tree May through August. Fruit is sweet, edible and attractive to wildlife especially birds. Flowers are perfect or unisexual. BARK: Smooth when young becoming scaly with age. FOLIAGE: Leaves are simple, alternate, deciduous, 3 to 9 inches long, can be oval or lobed and have serrated edges. 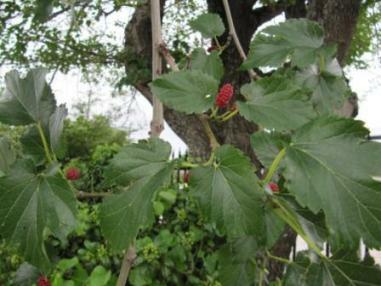 CULTURE: Red mulberry is easy to grow in any soil that is well drained. PROBLEMS: Mulberries can have several pest problems, even cotton root rot, if growing in unhealthy soil but the Basic Organic Program usually eliminates these troubles. The most common problem is the mess that is made from birds after eating the ripe fruit, so be very careful where you plant these trees. PROPAGATION: Mulberries are grown easily from seed which may be sown directly after collection or stratified for 60-90 days at 41 degrees and then planted in the spring, or earlier in a greenhouse. Fruit should be collected after they have turned red or dark purple, the seed should be thoroughly air dried and stored at the cold temperature in sealed containers. INSIGHT: Hybrid fruitless mulberry is a fast growing junk tree with large various-shaped leaves and shallow, destructive root systems. The plant uses large quantities of water, is a worthless weed and should never be planted. Other varieties include Morus microphylla which is the mountain mulberry which is a more bushy drought tolerant form that grows to 20 feet in height and may be multitrunked. Its fruit, like other mulberries, is edible when ripe. It grows in the canyons in limestone or igneous rock soils in the western 2/3 of the state. Morus alba is the famous white mulberry from China whose leaves are used to feed silkworms. Small weeping forms of mulberry are available that are effective for use in Oriental gardens.